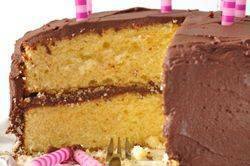 For this Yellow Butter Cake the two moist layers of cake are sandwiched together and frosted with a smooth and creamy chocolate frosting. This is one of my favorite party cakes and I often like to serve it with a scoop of vanilla ice cream. I find children, in particular, like to eat it this way. A Yellow Butter Cake gets its rich flavor and yellow color from using just egg yolks (not egg whites) in the batter. The cake batter is made using the 'creaming' method where the butter and sugar are beaten together first and then the egg yolks, followed by the flour and milk are added. It is quite easy to prepare and you end up with a soft textured cake with a buttery sweet flavor. Make sure to have the butter, egg yolks, and milk at room temperature. We are using sifted cake flour, which means you sift the flour first, then measure it. If you don't own a scale, then spoon the sifted cake flour into your measuring cup and level the top. Cake flour is a soft wheat flour with a lower protein content than all purpose (plain) flour. This produces a cake with a soft and tender crumb. You can make your own cake flour. Three cups sifted cake flour can be substituted with 2 1/4 cups (255 grams) sifted all purpose flour plus 6 tablespoons (45 grams) cornstarch (corn flour). For the milk, you can use either full fat (whole) milk or reduced fat (2%). The higher the fat content of the milk, the richer the flavor of the cake. Once the cake layers have been baked and completely cooled, we are going to frost the cake with a delicious chocolate frosting. This is the same frosting I used to cover the chocolate, yellow, and brownie cupcakes. It is made with butter, confectioners (icing or powdered) sugar, vanilla extract and unsweetened chocolate. I particularly like this frosting because it has a deep chocolate flavor and it's not overly sweet. It's made with unsweetened chocolate which is also known as baking, plain or bitter chocolate. This chocolate does not contain sugar, so it has a strong, bitter taste that is used in cooking and baking but is never eaten out of hand. Ghirardelli and Baker's unsweetened chocolate can usually be found on the baking isle of most grocery stores, or other brands I particularly like that can be found in specialty food stores, or else on line, are Dagoba, Guittard, Valrhona, or Scharffen Berger. Yellow Butter Cake: Preheat oven to 350 degrees F (180 degrees C). Butter and flour (or spray with a non stick vegetable/flour spray) two 9 x 2 inch (23 x 5 cm) cake pans. In a bowl sift or whisk the flour with the baking powder, and salt. In the bowl of your electric mixer, or with a hand mixer, beat the butter until soft and creamy (about 1-2 minutes). Gradually add the sugar and beat until light and fluffy (about 3-5 minutes). Add egg yolks, in two batches, beating well after each addition. Scrape down the sides of the bowl as needed. Add the vanilla extract and beat until combined. Evenly divide the batter between the prepared pans, smoothing the tops with an offset spatula or back of a spoon. Bake 22 to 28 minutes or until a toothpick inserted into the center of the cake just comes out clean and the cake springs back when pressed lightly in center. Place the cakes on a wire rack to cool, in their pans, for about 10 minutes. Then invert the cakes onto a greased rack. To prevent cracks, reinvert cakes so that tops are right side up. Cool completely before frosting. In the bowl of your electric mixer, or with a hand mixer, beat the butter until smooth and creamy (about 1-2 minutes). Add the sugar and beat until it is light and fluffy (about 2-3 minutes). Beat in the vanilla extract. Add the chocolate and beat on low speed until incorporated. Increase the speed to medium-high and beat until frosting is smooth and glossy (about 2 minutes). Assemble: Place one cake layer on your serving plate and spread with about 3/4 cup (180 ml) of frosting. Place the other cake layer on top of the frosting and cover the entire cake with the remaining frosting. Makes one - 9 inch (23 cm) layer cake.